This is Living Cheaply's review of a wonderful money saving product called the soapberry. The soapberry is becoming more popular over the years. These berries are by far the most sustainable/versatile cleaning product out there. With countless ways to use them, I'm sure you can find at least one chemical product you are able to replace with a soapberry. Best of all these berries can be found online at very affordable prices. Not only can soapberries replace your household chemical cleaners they are usually far less expensive as well. WHAT IS A SOAPBERRY TREE? These berries, also known as soap nuts, come from a Sapindus mukorossi (soapberry tree) found in both eastern and western hemispheres. The soapberries you will find online for sale are actually just the shell of the berries that grow on the soapberry tree. They are an all natural plant based product and naturally hypoallergenic. HOW DOES A SOAPBERRY WORK? Soapberries are in a sense a natural Saponin soap. These berries contain a large amount of the saponin in each berry. Saponin is released as water gets absorbed through the shell, working as a natural surfactant. For example, when doing laundry, surfactants help increase the water's ability to penetrate into fibers to help break away a stain. Front loaders have a slight difference in mechanics. They use less water and less agitation, therefore making it more difficult to activate the soapberries. The simple solution is to just presoak your bag of soapberries before placing into the washer. Place one or two soapberries in glass container pour in 18 oz of warm water let sit overnight water should be a yellowish color. 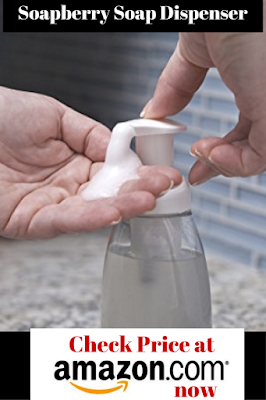 Pour into a soap dispenser. I use THESE to give it more of the soapy feel. Store in the refrigerator for up to two weeks. This is great to clean the countertops, floors, carpet cleaner, and fruits and veggies. Warning before you get started this will make a stink/funky aroma in the house. Take 2 oz soapberries (the more or fewer soapberries you use will make the concentrate stronger/weaker) add 4 cups of water bring to a boil and let simmer for 1 hr. Let cool then drain and you will have an amber color looking concentrate. Add 5-10 drops of your favorite essential oils to help with the smell. For storage put in a glass container, it will last up to 2 weeks in the fridge or put in the freezer last for couple months. Another trick you could put some in ice trays freeze and then pop two of the soapberry ice cubes in your washer. One ice cube is equal to 2 tablespoons. 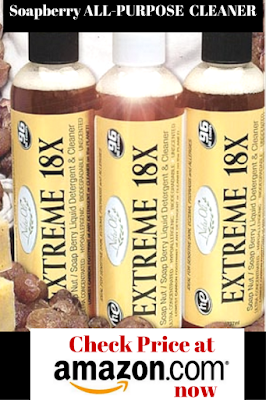 If your not into all that work you can simply buy a soapberry concentrate like THIS. 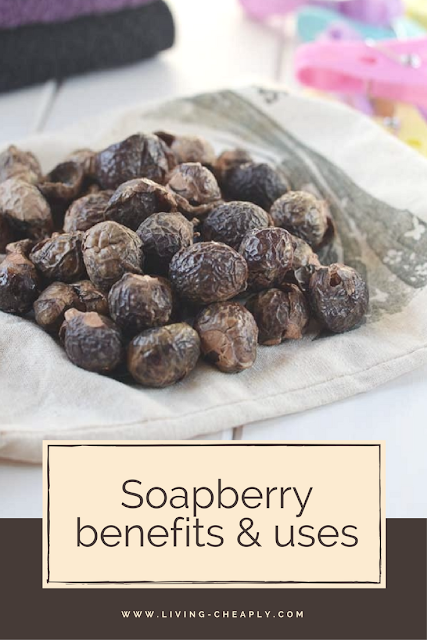 Soapberries are one of the most exciting ways to save money on cleaning supplies I have ever found. With the many uses of shampoo to all-purpose cleaner, these berries can be used for all most any cleaning task you can imagine. Best of all you will be doing so at a very low cost to you compared to other cleaners. One downside worth keeping in mind with soapberries is they give off an odor when you boil them. This is only an issue of course if you plan to make your on concentrate as I have. If you rather not deal with the small you can still buy soapberry concentrate. 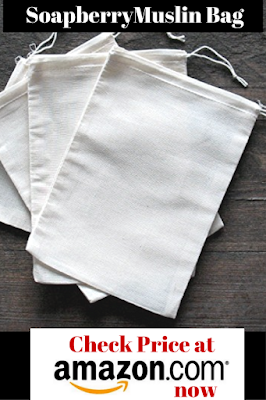 Regardless just using the soapberries as they are in the muslin bag works great for a very frugal price. If you have any questions regarding soapberries or would like to share your experience using them please feel free to comment below. As always, thanks for reading and living your fun-filled cheap life!